Everyone expects a child to throw a tantrum during the early years. Some parents even think it is CUTE. At age two, you can think it is cute but in an adult it will draw attention. 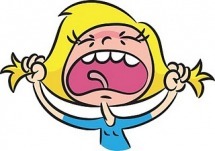 Unfortunately, what usually causes an adult to throw a tantrum is that they did not get THEIR way. Once you become an adult, you learn new ways that will let you control people, and at times it feels real comfortable. When you pray the Lords Prayer and say, “…Your will be done, on earth as it is in heaven…” Matt.6:10, you are turning your will over to God. The verb “be done” is a command for effective action. This is acknowledging that God knows best. If you are SINCERE when you pray this, nothing about your life should remain the same. You are deliberately coming against Gods will when you try to control your spouse. The two year old inside you, is controlling you until you totally surrender every day that area of your life to God. If you are an aggressive person in life, this is why. You can do something about it, you just don’t. Why?? You like the feeling of knowing that you can have it your way; YOUR WILL! YOU ARE ON DANGEROUS GROUND!! In heaven, the angels obey God and so should you with the Holy Spirits help for a flawless devotion. Are you letting” Gods will be done” in your marriage? Are you ready, willing and able to do Gods will in your marriage? Nothing breeds resentment deeper than for your spouse to have their will devalued and demeaned. They know your tricks to have your way but you don’t give them any CHOICES. Your spouse has a choice to give in or deal with the two year old within YOU. Your biggest grief is to deal with a self-guarded will. Are you looking for TRUE happiness in your marriage? True happiness is PERFECT submission to God’s will. You can’t give God lip service and continue to love the world along with your baby tantrums. That is like telling your spouse you love them and have a “playmate” on the side you really enjoy. To have Gods will in your life and marriage is to release the power of the Holy Spirit on your behalf. Step 1 – Choose God’s will. Step 2 – Accept it with thankfulness. Step 3 – Rejoice and delight in it. Ask God to refine you in his fire. He will do it with love and be there with you. Two year olds might be cute with tantrums; YOU ARE NOT!! You may not always get what you want, but you will become what you want! NOTE: Tomorrow there will be a new post he make your marriage a success.